I recently reviewed Junior's Pantry children's meals and thought I'd share a recipe with you from Junior's Pantry founder Kate Finch. 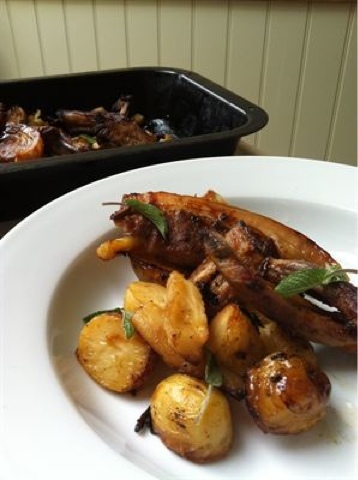 'Cheats Roast'- a recipe by Kate Finch. My family would happily have a roast every day of the week! I don’t fancy the time or the cost involved in that, so this is my mid week alternative – still a roast of sorts which keeps them happy, which is quick and pretty economical which works for me too!!! If the chops are large, cut them in half lengthways and divide the ribs into chunks (2-3 ribs) cut between the bones. Take the juice from the 2 lemons, the olive oil and the herbs and mix together in a bowl, with a little seasoning. If you have time to marinade the pork in this yummy mixture for an hour or so, then great. If that is a step too far on a Wednesday night then don’t worry! Scrub and halve the new potatoes, unless they are tiny, in which case keep them whole. Peel and quarter the parsnips. Quarter and core the apples. Put all the pork chops and ribs, the potatoes, the parsnips and the apples in a good sized roasting tin and pour the lemon, oil and herb mixture over. Give it all a good toss around to make sure the meat and veggies are covered in the juice, oil and herbs. Pop into the oven, at 220°C/425°F for 45 mins to an hour. Jumble the contents of the dish around a couple of times during the cooking, just to make sure nothing sticks. When the meat and veg are roasted and golden brown, you are ready to serve up a tasty plate of roast pork and vegetables, with the lemon and herb juices poured on top with a lovely big dollop of apple sauce on the side. You can of course vary the veg depending on what you have, and what the preferences of your family are – we often have carrots, sweet potato and pears, and I sometimes try to sneak a few leeks in too. Enough to feed a gaggle of hungry children, or a family of 4!